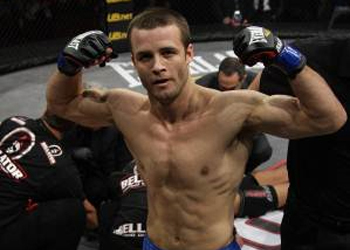 Bellator Fighting Championships featherweight champion Pat Curran (Pictured) broke his orbital bone Wednesday during practice and will be forced out of this month’s title bout against Patricio “Pitbull” Freire. Curran took Bellator’s Season 5 Featherweight Tournament by posting a devastating 2ndRound highlight-reel roundhouse kick to Marlon Sandro’s dome. He then went on to capture the crown this past March by putting Joe Warren down with a vicious barrage of strikes. Pitbull has been riding the pine for over a year after suffering a broken hand. He solidified his top contender status by running through Bellator’s Season 4 Featherweight Tournament. Unfortunately for the Brazilian, he’ll have to wait a tad longer for his shot at the 145-pound throne. “Bellator 73” takes place August 24th inside Harrah’s in Tunica Resorts, Mississippi. No word on who the show’s new featured attraction will be.